I’ve never bought a map directly from the maker before. I’ve never even met a maker of maps. Those magical things, doors into other worlds, worlds of dreams and worlds of their own, have come to me mass-produced by major institutions, with few questions asked, only guessing at their centuries-long history, bound up with war, money and power. Alessandro was excited and nervous as he handed over the maps one hot day in mid-September last year at Yerevan’s Impact Hub. They came fresh from the printers that morning, especially for us. 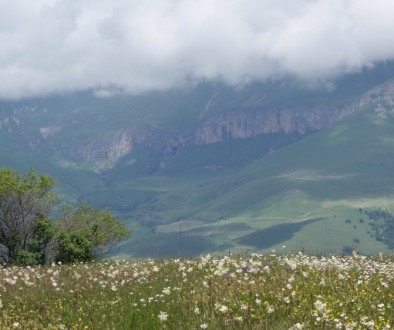 To him, we were four strangers, the first who were going to be using his creation to navigate the brand new section of the Transcaucasian Trail in Armenia that had been scouted and built only weeks before. Our feelings mirrored his. We were more used to walking the well-trodden footpaths of western Europe than venturing into a corner of the Caucasus none of us had ever visited before, where a walking community and all the signposts and guidebooks and security and comforts that come with it were all but non-existent. 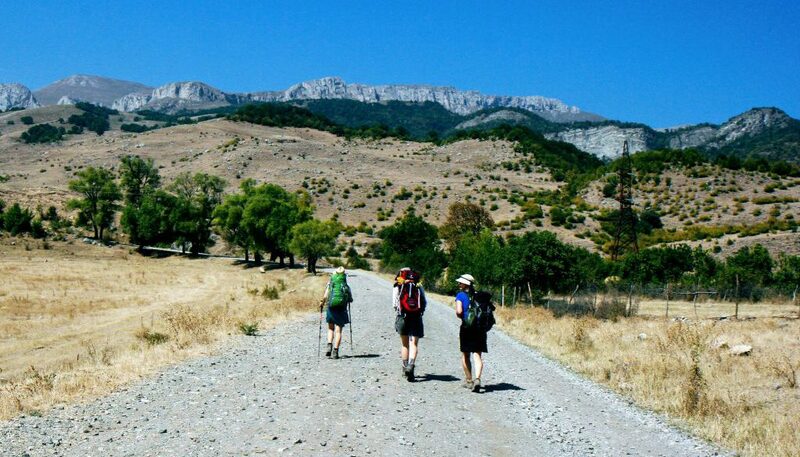 I’d been following the development of the Transcaucasian Trail and I knew from the beginning that I wanted to walk it. 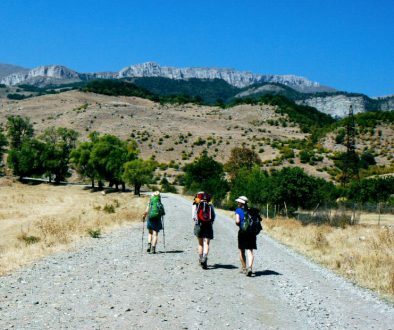 The idea of building a long-distance footpath from the Black Sea in Georgia to the Caspian, across countries with huge potential in terms of landscapes, nature and cultural capital, but with very little in terms of hiking infrastructure, simply seemed right. And the way in which the TCT was setting about making this ambitious dream a reality felt right too. They were involving local people, recognising that their engagement with and ultimately ownership of the project was critical to its success, not trying to make a profit, and being aware of their impact on the landscape and its ecological systems. They were so full of appreciation for these places and people, and were intent on sharing that love, generously and widely, by making them more accessible to others. The next day we took a marshrutka out of the capital and started walking towards the mountains from the roadside where it dropped us off. We followed old jeep tracks out of the small village of Hovk, checking the map anxiously at every turn to make sure we didn’t lose our way. An old man offered us some wild pears, freshly picked from a tree. Rising beyond the tree-line and heading towards a wide curtain of limestone cliffs, we saw horses grazing on the last of the summer’s grass. Unfenced, free, not even raising their graceful heads to look in our direction: these were their mountains, meadows, and rocks, and the forested valleys below, stretching in hazy ripples as far as the eye could see. It didn’t seem possible that a path could take us through and over the vertical face of rock ahead, but it did, up onto plains over 2,000 metres high where eagles soared on currents of rising air. The midday sun beat down on us, golden grass and dried out flowers. We knelt down in the waters of a stream to wet our faces and quench our thirst, and felt already a million miles from where we’d set off. Over the next five days, I grew to know and love the language of the map, its colours, symbols and lines becoming ever more closely connected to where I stood and what I could see around. We came to trust we’d always find a spring in the spot marked by a small droplet; and that on higher ground at least there’d be water we could drink. We found out that the marked shelters were a random and varied assortment of Soviet relics, basic structures with a roof offering only some respite from the sun or the rain. We came to know that each small black square was indeed a building, and to hope that it may be home to shepherds as kind and welcoming as the ones we met on the first day up on those high plains above the Hovk cliffs. Having spotted us miles away as we picked our way uphill, the shepherd had waited patiently for us to see him, then led us silently to the hut where his wife made coffee, and over vodka, sweets, and fresh fruits we talked in the few words of Russian we spoke, and in hands, fingers and wide smiles, and warm parting hugs. They were fascinated by our maps and our presence there, just as much as I was by their lives, so different to mine. For five months of the year they lived up there, on the clifftop with vast views of the valleys below, with their pigs, sheep and dogs, seeing the sun rise and set each day, and so much silence, so many stars. The best moments were of course the ones like these, that no map could ever contain, and no guide could ever script, but without the TCT team, and Alessandro and his maps, we would never have been there at all, and for this, no words are thanks enough. Enormous thanks to Jennine for sharing such a wonderful description of her experience! You can get your own copy of the Dilijan National Park map by backing our current crowdfunding campaign – and with just a few days to go until the deadline, your contribution will make a real difference. Click here to find out more and support our work with a pledge. Beautiful writing. I would love to experience those tracks up the mountains, meet the shepherd and his wife, see the carpet of stars. Thanks for sharing.